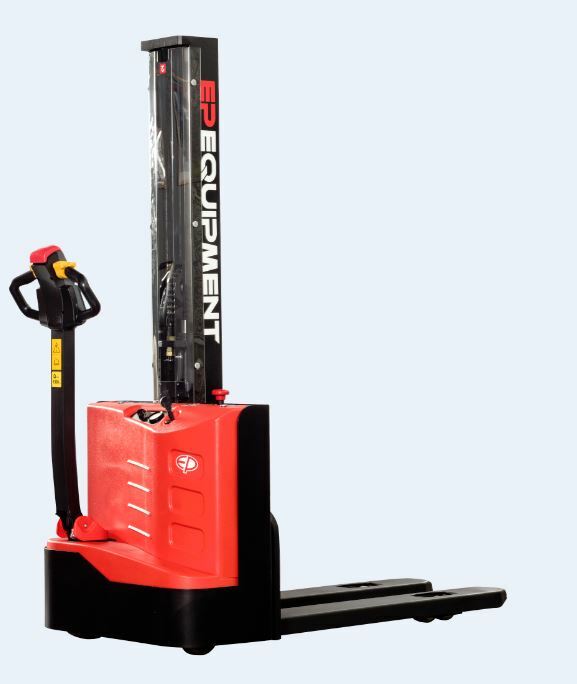 The ES12-12MM stacker from EP Equipment, a mono mast stacker with a lifting height of up to 1955mm helps you lift goods to a ergonomic working height or ensures a safe storage in your racks.Available with a full-free lifting height of up to 1955mm-1200KG capacity – gel battery and an integrated charger. In small warehouses, production or retail environment and especially height limited space, the ES12-12MM walkie stacker from EP Equipment is the ideal truck to optimize your daily work. This warehouse lifter with a mono mast and side operating design, ensures you excellent visibility. Back pain is one of the most common reasons for pain based absence of workers. With our mono mast stacker we increase the ergonomy of the workplace at a very attractive price level. Each worker can place the pallets on a individual suitable hight. This will not only decrease pain and strain for your workers, but also increase the productivity.